The Grayson County ARC is proud and honored to bring you these Special Events and we look forward to receiving your QSL card in the mail. Please include a SASE with your card. We also QSL via eQSL and LOTW. Perrin Air Force Base began as an army air field and was the first basic flying training school to become operational after the Japanese attack on Pearl Harbor on 7 December 1941. In the spring of 1941, Grayson County leaders began to discuss the possibilities of a U.S. Army Air Corps basic flying school to be built in Grayson County. In March 1941 Grayson County Judge Jake J. Loy went to Washington, DC, to further the project idea. After his visit to Washington, Judge Loy returned to Sherman and began to work on the project with county commissioners, and a tract of land was subsequently selected that was suitable for use as a flying field. On 9 August 1941, Major Robert J. Warren was the first person to report to duty at the partially constructed airfield, assuming duties as project officer and temporary commanding officer. Ten days later, five enlisted men arrived from San Angelo, TX, to assist Major Warren in the development of the airstrip, hangars, barracks, and field headquarters building. The airfield was laid out with four runways in a triangle pattern, all constructed of concrete. A large parking apron was constructed to accommodate the planned basic (phase II) training aircraft with at least 6 maintenance hangars and supporting buildings. East of the airfield, a ground support station was constructed consisting of about several hundred buildings based on standardized plans and architectural drawings. The buildings were designed to be the "cheapest, temporary character with structural stability only sufficient to meet the needs of the service which the structure is intended to fulfill during the period of its contemplated war use." To conserve critical materials, most facilities were constructed of wood, concrete, brick, gypsum board and concrete asbestos. Metal was sparsely used. Perrin Field was designed to be nearly self-sufficient, with not only hangars, but barracks, warehouses, hospitals, dental clinics, dining halls, and maintenance shops were needed. There were libraries, social clubs for both the officers and enlisted men, and stores. On 7 December 1941, the strength of the airfield stood at 90 officers and 545 enlisted men, with the first class of cadets expected by the end of December. In January 1942, the installation was renamed Perrin Field in memory of the late Lieutenant Colonel Elmer D. Perrin, a native Texan who had been killed in a 21 June 1941 takeoff crash during an acceptance test of B-26 Marauder bomber, 40-1386, near the aircraft plant. He had served as the district supervisor, Eastern Air Corps Procurement District since 1939, and was the Air Corps representative to the Glenn L. Martin Company, at Middle River, northeast of Baltimore, Maryland. Lt. Col. Perrin was the Air Corps's most experienced B-26 pilot at the time of this accident. Basic pilot training was discontinued at the base in late 1945, and an instructor school was established to maintain instructor proficiency and provide refresher training for oversea returnees and behind-the-line pilots, but the base was deactivated in November 1946. Perrin became a storage facility for aircraft such as the AT-6 Texan trainer, the B-25 Mitchell bomber, and other equipment, such as tractors and bulldozers. The only operational aircraft was the C-47 Skytrain. 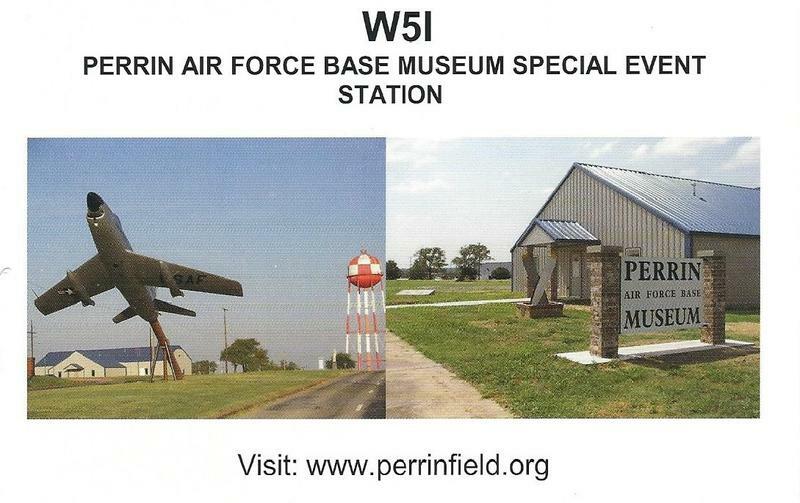 On 1 April 1948, Perrin Field was reactivated under the newly established United States Air Force, hosting the 3555th Basic Pilot Training Wing from August 1948 to June 1952. A shortage of funds caused the base to be opened with only a caretaker group on hand. Three months later, on 1 July, the base began training. It resumed its mission of basic single-engine pilot training under the Air Training Command (ATC) and continued until December 1951. Training continued until 1971,involving such famous aircraft as; the T-33 Shooting Star and F-86 Sabre as well as the F-102 and TF-102 Delta Dagger. On 3 March 1971, it was announced that Perrin AFB would close due mainly to a change in pilot training requirements, primarily the retirement of the F-102. In addition to the phaseout of the F-102, airspace congestion following the opening of the new Dallas-Fort Worth International Airport was also considered to be a secondary factor. On 13 May 1971, the last graduating class flew a formation of F-102s over Sherman and Denison as a farewell to its two host cities. A few days later, the last of the F-102 Delta Daggers left the base and the 4780th Air Defense Wing was inactivated. On 15 May the T-37 instructor pilot training transferred to Randolph Air Force Base in Universal City, Texas near San Antonio. Perrin AFB closed on 30 June 1971. The GCARC is honored to offer this Special Event station as a salute the men and women who served our country while based at Perrin Field.